Natural Blueberry Yogurt was posted on February 25th, 2011 and is filed under Breakfast, Desserts, Gluten Free, Kid Friendly, Low Carb, Recipes, Snacks. This entry has 6 comments. You can follow any responses through the RSS 2.0 Comment Feed. I find that any store bought, fruit-flavoured yogurt is not only high in calories, but extremely high in sugar. And it’s not usually sweetened with something natural…more like the evil high-fructose corn syrup. We must defend ourselves from its iniquities, haha. More or less, I’m pretty dairy-free right now…but I have to say, then when I did eat dairy I would eat yogurt every day…sometimes twice or three times. It was one of my favourite things. I never ate the sweetened stuff. I loved the tart, smooth plain version, often sweetened with a little stevia and sprinkled with blueberries and granola. I would mix in all sorts of combinations. It often would play the role of dessert, breakfast, post-workout snack, and movie night eats. In fact, I’m still pretty much in love with yogurt. So although I actually didn’t eat this recipe, I made it up for an afternoon snack for my sisters (one who is visiting with her family right now). They loved it and one sister said, “It tastes so real.” It’s funny how the conventional flavoured yogurts do taste somewhat artificial. My little one year old niece gobbled it up and walked around for a good while with blueberry all over her face. Somehow kiddies can get away with anything and still look completely adorable. This recipe serves two. Mix the berries and the agave nectar up in the blender. I whirled them for a bit, but still left it unsmooth. I wanted some blueberry bits to add some texture. Separately, stir in the Truvia (or whatever sweetener you’d like) to the yogurt. 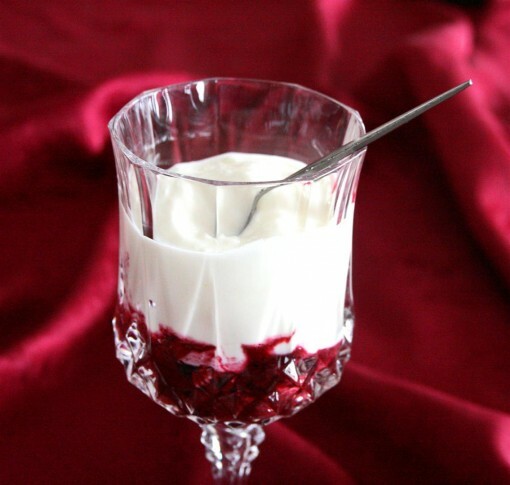 Put half of the berry mixture in two glasses and top with ½ cup yogurt. There you have it! This is a perfect afternoon snack for children! You could do this with any fruit…I can imagine how lovely it’d be with strawberries or raspberries. This is a perfect breakfast, post-workout snack, or even dessert. It looks very elegant in crystal wine glasses. Enjoy! Yum! I have some blueberries and yogurt left, so I may give this great treat a try! Thanks for sharing! I’m from the Balkans (lactobacillus bulgaricus is the bacteria making the yogurt and it comes from my country) and I grew on plain yogurt. Here you can buy mostly the plain one and there are very few sweetened. You can also buy freely the raw one, but that’s another story. This and bircher muesli got me through 3 years of naturopathic college mornings. I miss those times when I could sit through my tub of yoghurt while listening to the wise words of the herbalists. I love your bright, colorful, healthy blog! It’s lovely and delicious. Beautiful pics!